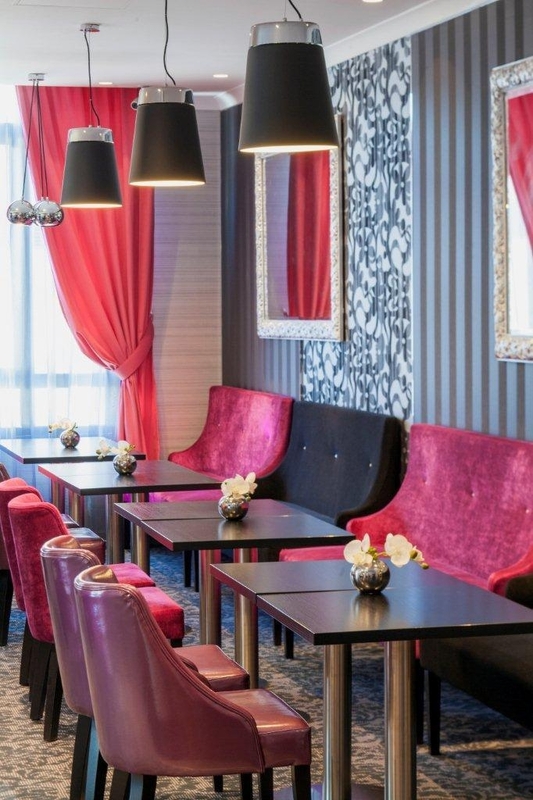 The Best Western Allegro Nation is ideally located in the center of Paris. Come and experience our hotel near the major tourist attractions. Best price guaranteed and exclusive deals. 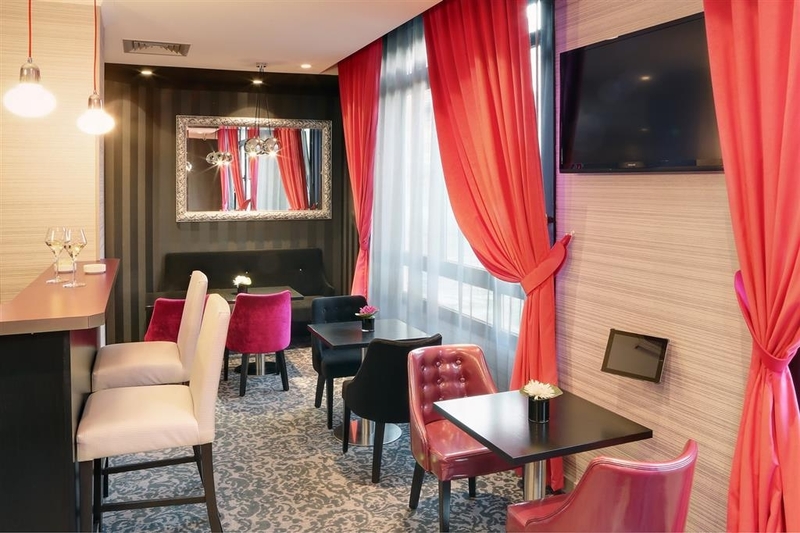 Enjoy your stay in Paris at the Best Western Allegro Nation, a four star hotel, situated in eastern Paris near the Palais Omnisport of Bercy. 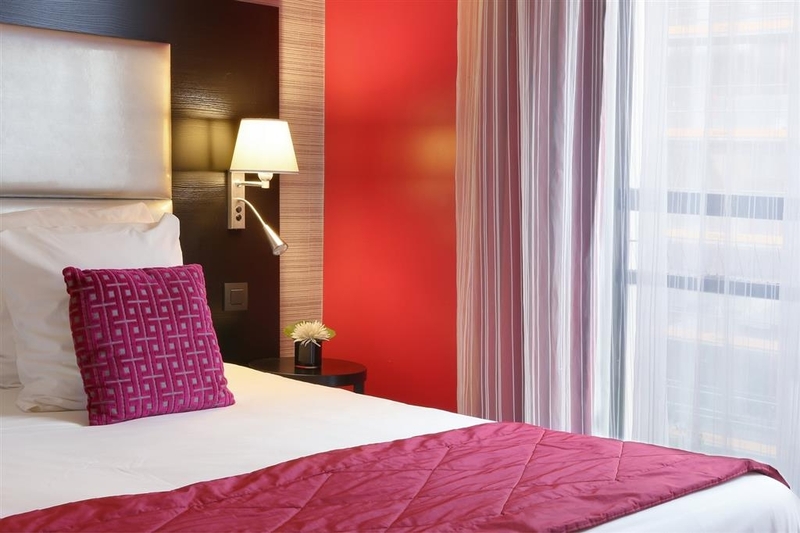 The hotel is also near the Bastille Opera House and the Francois Mitterrand national library. Each of the hotel's 49 bedrooms is equipped with a bath, satellite television, direct dial telephone and Wi-Fi. And of course, the Best Western Allegro Nation is fully air-conditioned and has private parking. Enjoy your stay. "house keeping stole things from your luggage"
my family and I traveled there from Sweden and spend 3 nights there from Friday 5th Oct to Sunday 8th of Oct. 2018, On Saturday when we got back from our visit to the city my jewelry box was not in my luggage where I have put it before leaving the room. there were 3 items in my jewelry box, a neckless, a bracelet and a pair of earrings. I told the front desk and they told me they will look into it and they know who is the one who cleaned our room and they will contact her to bring them back, they kept trying to convince me that I was mistaking and it was not stolen from my luggage and since I am very organized I always check everything multiple times I was sure it was stolen, On Sunday there was a different guy at the reception and he showed me a note that said the maid found my glass jewelry box on the desk and throw it in the trash, since It was in my luggage I was sure about it being stolen and also you never throw something away when there are jewelry in it. On Sunday also when we got back somebody has looked into our luggage and change the order of things in our bags. (there were nothing to be stolen anymore ) I talked to the manager the day after, she told me that I am mistaking and it is impossible to be stolen from inside of the luggage but she went upstairs to talk to the maid without even checking who was the cleaning lady responsible and came down and told me to go to the police and follow some kind of insurance steps in case of a rubbery. It is obvious that she was aware of the situation if this happened once it must have happened before too. fortunately the stolen jewelry was not gold or silver, however, I will not choose this hotel to be my destination anymore, this is a pity since it is a really good hotel with good location. But when your things get stolen from the room you feel unsafe (like I was feeling and could not sleep during the nights) and since I paid my stay before I didn't want to waste my money and go to another hotel. I truly advise you not to choose this place to stay. even if you find a convenient price for it it's not worth it. on the other note, the location is nice, the rooms are fine and clean. I wonder how it is a 4-star hotel with a thieve between the staff though. the cleaning doesn't matter when they took your stuff. Worst customer service attitude I've ever seen at the reception of any hotel let alone a 4 star. No greeting, she made us wait for no reason at check in and was outright rude. No hand soap in the bathroom which was tiny.. no fridge, no iron. Hotel is not clean or well maintained. They lock their front door since the area is not that great. Priceline sells this as an express deal, worst deal ever. I'd give this hotel ZERO stars if I could. Not recommended at all. 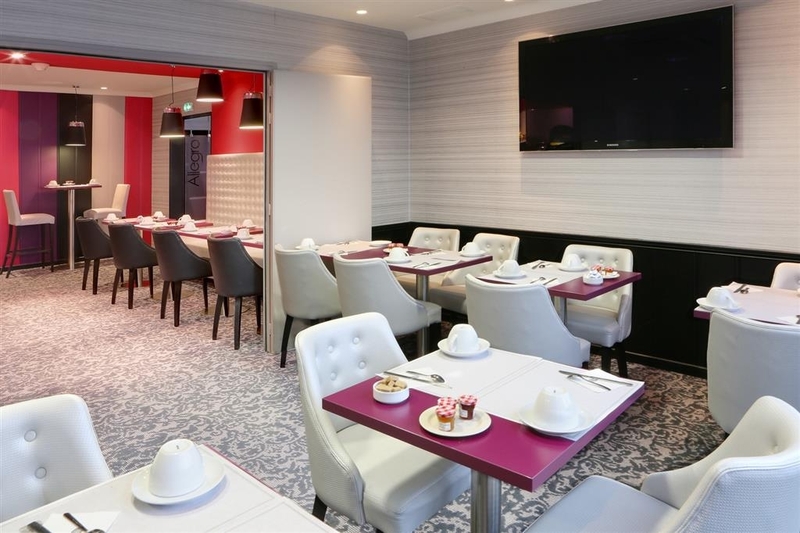 Brilliant hotel, used it to go into Paris and go to Disneyland located a 5 minutes walk from 2 metro lines which are very close to the central line allowing easy transport to Disney and central Paris. Furthermore has a grocery shop across the road making it easy to purchase food and water. Staff very friendly and cleaners went out of there way to tidy our room every day even reorganising our items in the bathroom into a neat line. 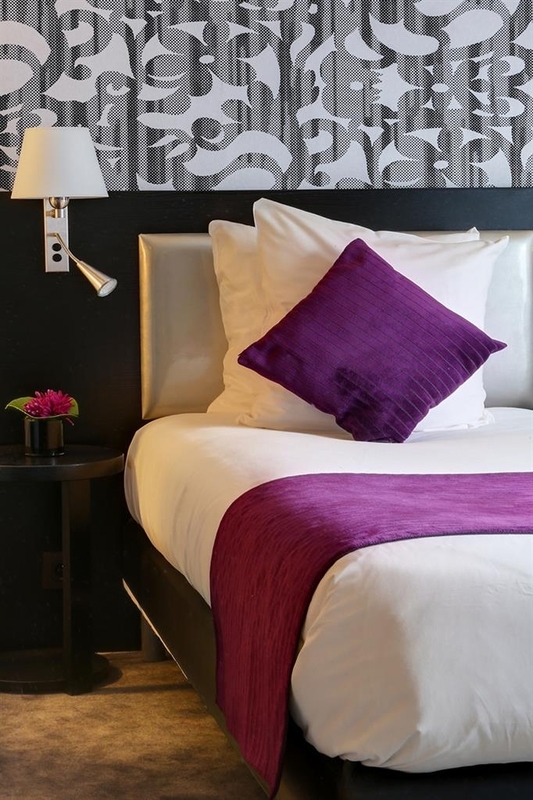 Couldn't rate the hotel higher made our 5 day stay in Paris very comfortable and enjoyable. "Broken into and robbed, along with four (4) other rooms!" My wife and I woke up to find my laptop was missing. When she next saw her jewelry box ripped open, we knew our nightmare was coming true. We went downstairs and learned that we were the last to report theft, as four other rooms had been broken into as well the night before. We just hadn't noticed the night before after returning from a late dinner and going straight to bed. 2500 euros and a $1600 laptop was missing and because they have no CCTV in the hallways, they had no leads. When asked for help, they couldn't provide any help and said we had to go to the police. We reported the crime and then the search for assistance began and a month later, we're still trapped in this nightmare and huge financial loss with no end in sight. The French Hotel's management basically told us there was nothing they could do. And headoffice has been completely useless. DO NOT STAY HERE. It's a dodgy part of town and the service you will get, or lack thereof, along with the aged hotel that awaits you will leave you with regret. We stayed here for four nights on a trip to Paris.The rooms were a bit dated and in need of a freshen up, especially the carpets, but overall had a good nights sleep. For value and location though the hotel was ideal. Breakfast was well worth paying for with a good selection of pastries, pancakes, meats, cheeses, yogurts, fresh fruit aswell as a coffee and hot chocolate machine. Nearby is most wonderful bakery just few minutes walk away. Also a small supermarket is opposite the hotel if you need anything. 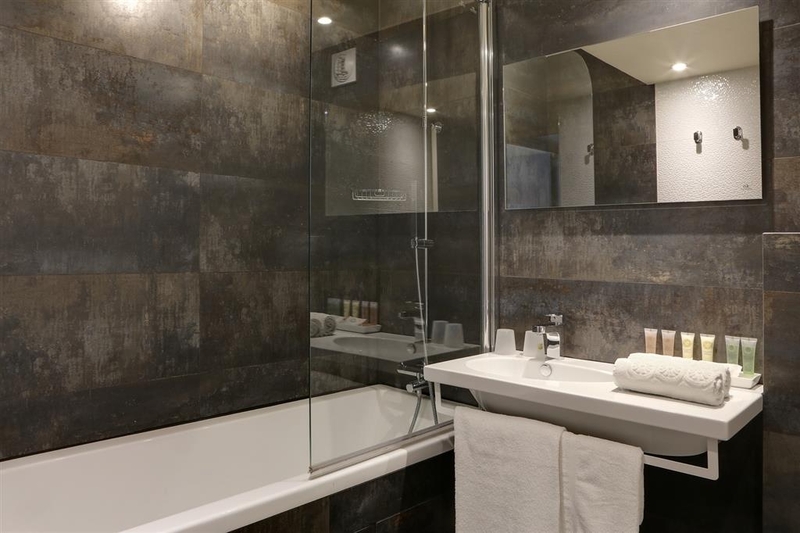 Location is great as it is only a five minute walk to tube station. 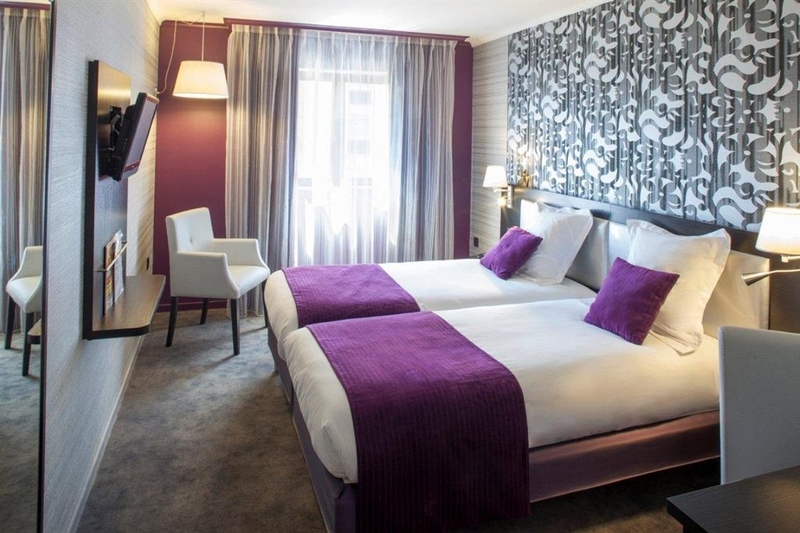 We needed several rooms with short notice due to a business trip to this part of Paris. Taxi ride from the airport was sluggish due to heavy traffic on the freeway. Traffic around the hotel on the surface street was not too bad. Friendly reception and check-in. Rooms were fine, I slept comfortably. Breakfast could have had more healthier options. Dinner restaurants within walking distance. Wouldn't hesitate to stay here again. Booked it last minute through a hotel site since we had to stay in Paris for two nights. Check in was easy, the staff were very polite and helpful, the decoration nice, comfy beds, and the shower... oh my God, the shower! I fell in love with it! It made me realise why in most movies when a person showers they look up.. It's because they have such a nice shower! Also they have a free luggage storage which was really helpful. There is a convenience store right outside where we bought nice sandwiches for breakfast. The hotel is near Picpus metro station which is not that central but we didn't mind our long metro rides. "THIEVES!! Hotel management is a JOKE!" If you are interested in experiencing the worst customer service and the worst hotel management in de world, I think this is the PERFECT hotel for you! I lost my sunglasses on the last day we left from the hotel, when I was home and noticed it, I IMMEDIATELY called the hotel (around 11pm) asking if they have found anything, the guy at the reception desk BARELY speaks english and didn't understand a thing I was saying, he asked me to call back the day after when another person was at the reception desk. I did that, they haven't found anything they said, so I asked if they could possibly check the security footage to check what happend with the glasses, because that was the last place I knew I had them. He gave me the manager on the phone (who actually also barely speaks english and doesn't understands a thing you are saying unless you repeat it 5 times). I told her the story and she confirms they have a camera placed at that angle where we we're sitting but also confirm that she won't take a look at the footage because she is too busy. EXCUSE ME? Is this how you threat your customers who just spend 3 nights at your hotel? These glasses we're 450 euro's but even that doesn't matter, if they we're 50 you should just check and let me know it doesn't matter! After a huge discussion on the phone she promised me to take a look and call me back the day after. Well here we are, 5 days later and still NO CALL! This is just so upsetting, I travel around the world and I sleep in 3 to 5 stars hotels and trust me this was the worst ever. I hope I never have to experience this again. For the hotel: Rooms: Small but OK. Cleaning: Cleaning is OK, but the times are really weird, one day she came at 4pm , the other at 1pm and the last day she stood at our door at 10.30 AM in the morning!!! Breakfast: A small choice of different things, but the guy managing the breakfast is REALLY slow and nothing is on the buffet (no forks, no knifes, no napkins, no spoons, no cheese, no yoghurts, no nothing) When I ask him for a fork he brings me one 10 minutes later. All the tables we're dirty and there was no place to sit because he couldn't handle it. The girl doing the breakfast did a better job and everything was nicely managed. Reception desk: VERY unfriendly staff, only 1 person at the check in was really friendly and nice, but the other ones we're NOT! We asked for an umbrella because it was raining there weren't any, for a 4 star hotel you at least expect a reasonable amount of umbrella's, they told me they have 3-4 umbrella's for the whole hotel? So when we got back in the evening there was one, we asked if we could take it for the next morning (it was already 1am midnight) he said we couldn't. So the next morning we wanted to take it, they we're GONE! Nice management here... Location: Location is like a 5 min walk to a subway station. The neighbourhood isn't that great, with a lot of people on the streets even at midnight (not the kind of people you want to see at that time of the day, you know what I mean). I didn't felt safe walking there past 9pm (summer time). 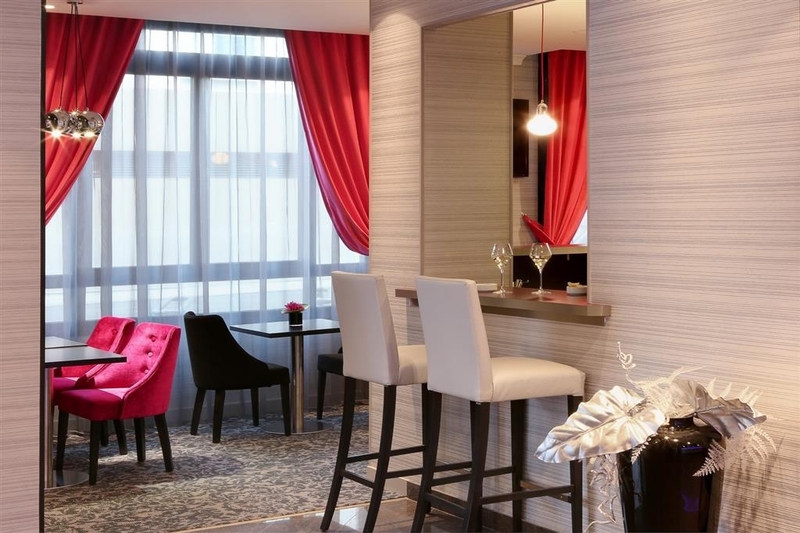 Price: Too expensive for what you get, there are enough hotels in Paris (even 3 stars) that are much better and you get much better value for your money. You won't see us back! "Bathroom sink broken - 2 days in a 5 day stay"
I have stayed here in June 2017 for 5 nights. The location and breakfast were good but in the next morning we noticed the sink started to leak water all over the floor, not what I expected for a 4* hotel! The front office person told us that it was impossible to get someone to fix it and also that they were full and could not move us to another room. We had to stay 2 days in that room with towels in the floor. Only the night front office guy was very friendly and talked very good english. If it wasn't for him, we would have stayed all 5 nights in that room. The manager never talked directly to us, neither to apology or offer a partial refund or another solution. I would have given this hotel a better score (at least 4 stars), but this situation was very annoying and almost no one talked english, so were by our own. Another situation, was that we have sent an email before arriving the hotel, asking if the city tax was already paid or not and they have replied that it was all paid, but we had to pay it in the checkout and when showing the email, they told us that the person that replied to our email couldn't understand english very well. This type of thing shouldn't occurred in a 4 star hotel. For sure, I'm not going to stay in this hotel chain again. It was a first and last experience. 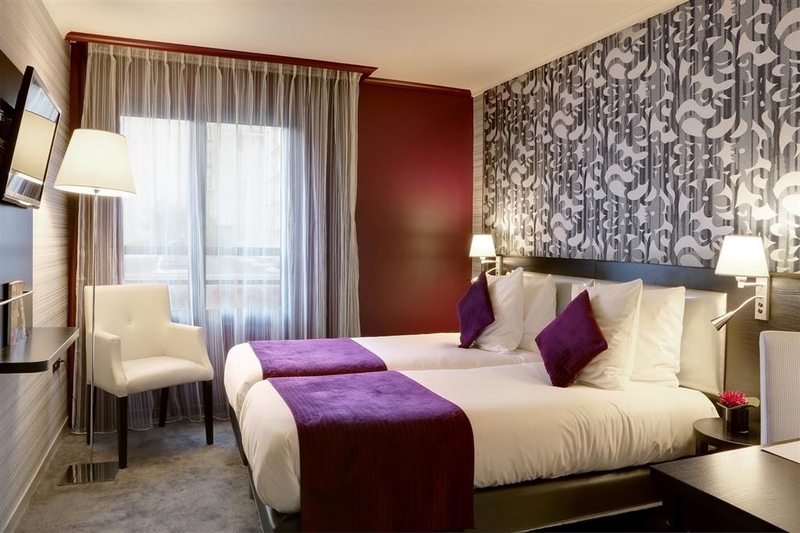 "Good base for Bercy Stadium "
Lovely hotel, good size comfy rooms. Good selection for breakfast. Parking available only if your car is the size of a smart car as you need to use a lift. There is public parking about two blocks away. 10 mins in car to Bercy stadium - 25 mins walking. Stayed at Best Western Allegro for 3 nights, we didn't know we had to pay £100 deposit. We got told that the deposit will be refunded after two weeks. The hotel staff were friendly, and very helpful. Wevchecked out on the 18th of May and to our suprise no deposit has been refunded, nothing was broken nor did we use any extras. Stayed at this hotel last week (May 25- June 1). The hotel itself is clean and comfortable but someone stole my daughter's back pack from the room witH passport, jewelry, credit cards, iPad and ID. The manager on duty did not seem to care. They kept telling her she misplaced it when she did not leave the room with it. Only staff had the key beside her. The police didn't seem to care either. They gave us a paper to take to the US embassy to get a new passport. It was as if we told them we needed a cup of tea and they recommended where to go. Terrible violation of ones security when you give them a key to their room they should have a sense of safety and security. There doors don't close well and they have no security cameras in hallways. They blame you for someone entering your room! Unsafe hotel in a safe neighborhood. The hotel is pleasantly decorated and comfortable. Bathroom was pleasant as well with a great showering facility. Breakfast is offered for an extra charge but the spread was paltry so I would not recommend paying for it. However, the worst thing is that the wifi was not working for our entire stay (2 days) there. Had to use our personal data which is not the most pleasant. They should have fixed the wifi within a day. Tried to borrow an adaptor twice but was not available. This doesn't sound exactly like a 4 star hotel. The male receptionist was friendly though. It's located right next to Franpix, a mini supermarket where you can get whatever you need. There are restaurants dotting along the street too. 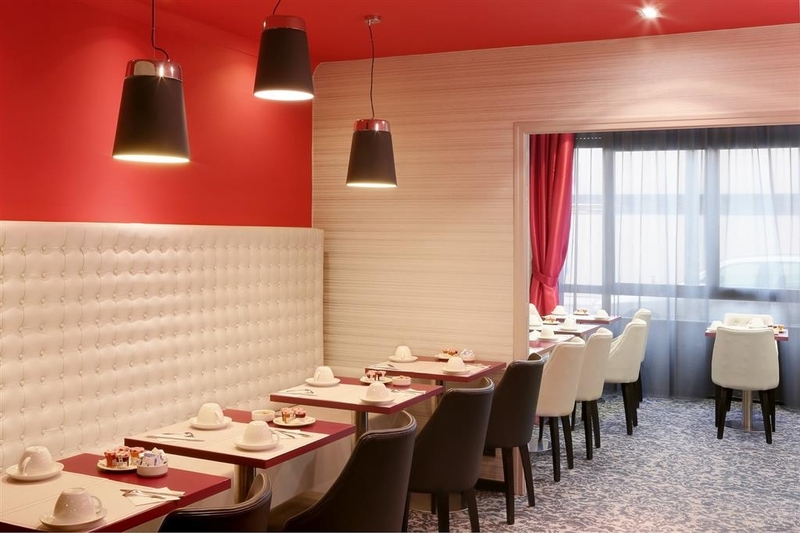 You should try a particular Chinese restaurant (au savour printemps) near the hotel. It was a 10 minute walk from the Metro (Porte de Vincennes Station) which is reasonably situated from major attractions in Paris. Final verdict: If you want an affordable homely hotel tucked in a quiet neighbourhood but still accessible to the city, then this is for you. "Neat, Friendly Hotel with Great Service"
Located in a nice corner opposite a convenience store, this BW is a neat little hotel. The rooms are small : one needs to be careful while doing Yoga here though they are large enough to allow you to change your mind. Some little niggles are there but staff is highly Service oriented and they make you feel welcome and taken care of. I stayed for 5 nights and it was a great stay. The funniest thing in the hotel was the Hindi translation in environment friendly reminder in the bathroom. It's hilarious. They should not change it : it brings a smile on your face every morning. This hotel is not a four star! There was visible mold in the room they put us in. They moved us to another room the next day. However, carpets are stained and although clean carpets should be replaced. Wall blow dryer over heated and when I asked front desk, all they said was sorry someone must have it because there is an empty box. They did not once try to help or cross the street and buy one at the store. I would not recommend nor stay there ever again. "good place but rude receptionist"
I'll be honest, I picked this hotel because I was on a budget and wanted to ensure that my wife saw as much of Paris as possible without sending us bankrupt. What we got in return was a hotel that had incredibly friendly staff, a great breakfast buffet (for french standards from where else I've eaten), and easily accessible transport. The room was decent, there isn't too much to it apart from your basics, but they're all clean and well kept. It may also be considered small, even with a King sized bed in there, but it was just what we needed as ultimately we were looking for a place to rest our head. If you are on a budget but still would like something that is not run down, and are happy to walk five to ten minutes to the nearest train to see all your touristy things - I would recommend this Hotel. This is a very decent hotel. The room was clean and comfortable with a large double bed. The front desk staff were very helpful arranging for an early morning taxi and getting me an extra blanket. The only drawback was the bathroom. There was a large fixed shower head but no shower curtain. For love or money I could not get that shower head to turn on. Instead I had to use the hand held telephone shower which sprayed water right in my face. And I had to quickly mop water off of the floor since there was no shower curtain. The Best Western Allegro Nation was a pretty good place to stay. The hotel was clean and affordable. The staff was helpful and considerate. It's about a ten-twenty minute walk to the nearest metro stations, which allows for a scenic view of the neighborhood. The local bars, restaurants, and shops were all full of friendly people. 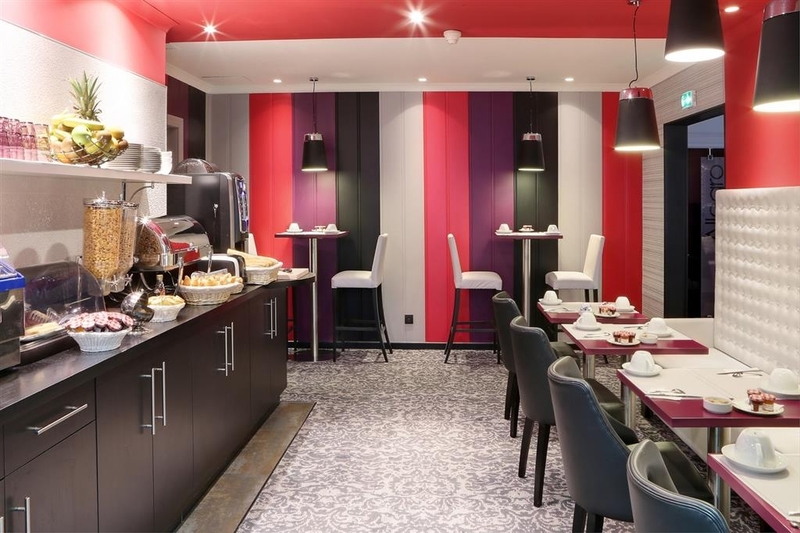 Not the most charming part of Paris, but if you need to stay around that area, this friendly hotel might be a winning choice. The room is not very big but the bed is clean and big, resulting in a good sleep quality. The area is not crowded so the rooms are quiet too. The shower seems to have been recently upgraded, very cool. However too much design in mind is not always the way to go, the stepping surface is quite slippery. Good Philips new TV, with an USB port allowing you to easily connect your hard drive and browse for movies. The breakfast is good, featuring fresh French bread, croissants, good cheese and acceptable automatic coffee. Friendly staff, the night guy was very helpful when I told him the heating system didn't seem to work in my room: I was offered extra blanket and portable heating radiator. In fact the issue was solved the next night. Also, the wi-fi worked pretty good the first night but not so good on the second (hotel was fully booked). Getting the signal from the lobby solves the problem. The hotel staff were friendly and helpful. The room is small but enough for two people. We stayed in the first floor. The carpet of the room had some mold on it though at the edges. The room had good air conditioning. 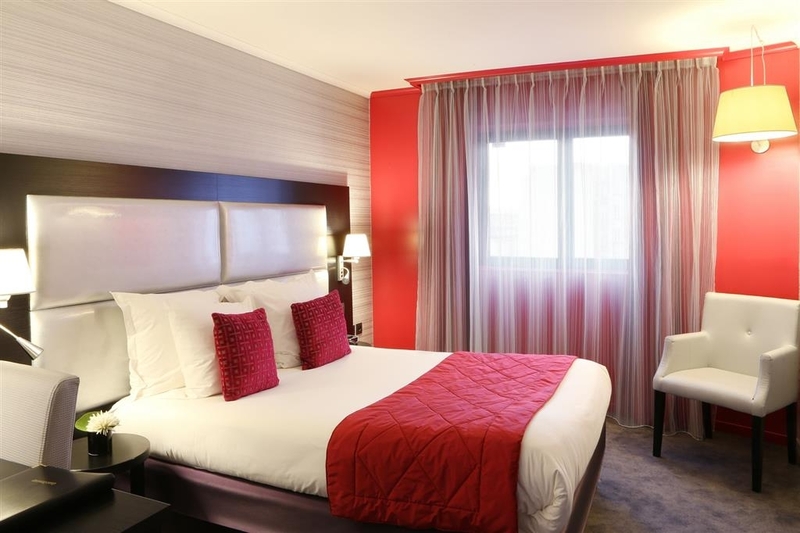 The hotel is conveniently located within walking distance from picpus station. This hotel is very nice, but what was really impressive was the customer service of the staff, and the flexibility that they gave me with my booking. My 8 year old daughter was taken ill whilst we were on holiday at Disneyland Paris, and she ended up in the hospital across the road from this hotel. I booked the hotel online for one night, but in total, stayed for 8 nights! My daughter required surgery after being in the hospital for a few days, and the hotel was most helpful allowing me to book additional nights as we went along, and always trying very hard to accommodate everything I needed, including ordering food in for me in the evenings after spending long days in the hospital. I returned to the hotel around 8pm every evening, and woke at around 3am to walk across to the hospital and swap with my wife who could then return to the hotel and sleep until around 9am. The night porter was always helpful in letting us come and go in the early hours. On the last night of our stay, we needed a larger room as my daughter had been discharged from hospital. They were most accommodating in providing us with this also. 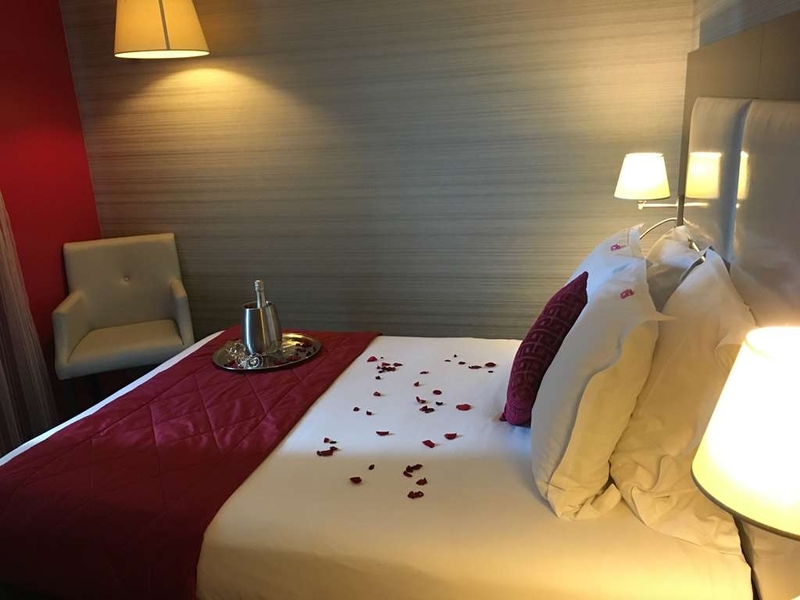 I cannot compliment the staff and hotel enough for what they did for us, and they made a very difficult time in our life a little easier with the fantastic service that they gave. Stayed at the hotel for four nights during September. We opted not to have breakfast as there is a supermarket right next door for a quick croissant before a day of sightseeing. Found the reception staff to be very pleasant and helpful. The room was also fine - a nice powerful shower and comfortable bed. Transport towards the city and airport were also good. There was a few nice restaurants nearby also - Le Cosy was fine and Le Picotin was amazing! The room was attractive and clean and the bed was comfortable, but I was amazed at the small room size considering I had booked a 'superior' room. This appears to mean that although the room is small the bed is king size - so making the room appear smaller! There was not a single drawer in the room and the wardrobe had only one shelf, half of which was taken up by the safe. This meant that for our 3 night stay my husband and I had to share half a shelf for our non-hanging clothes and other items. I ended up living out of my suitcase - not what you expect in a 4 star hotel. There was also a lack of flat surfaces on which to place items, and as the round bedside table was about the size of a dinner plate, I had to place the hotel phone on the floor to make room for my book and a drink! The bathroom had just about enough storage space for toiletries etc. 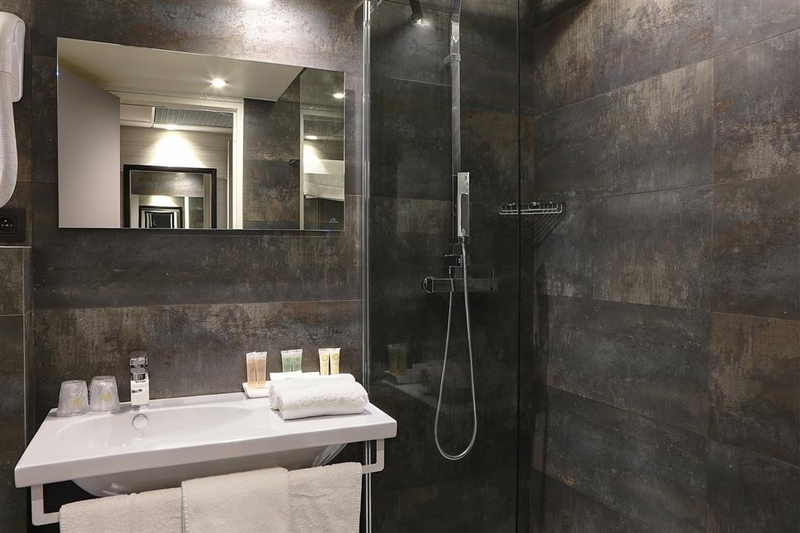 but the shower was over the bath and the bottom of the glass shower screen did not meet the top of the bath, causing a flood when the shower was used. We remedied this by putting a hand towel in the gap. There was little traffice noise evident in the room - helped by triple glazing. The hotel location isn't bad but a bit off the tourist trail, being largely in a residential area. However there were three nearby metro stations and several restaurants in the area, so it was rather nice to be eating with locals rather than tourists. 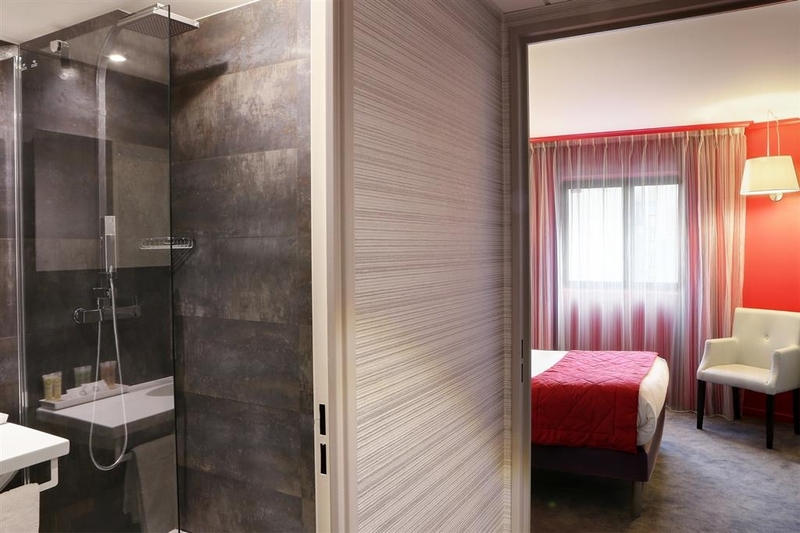 I did complain to the receptionist on being given such a small room, when we had booked a superior room, but I was told that it was normal in Paris. This wasn't borne out by what I could see of other rooms when being cleaned. Rooms are clean and done up in a modern style. Just enough space to be comfortable. Cafes and restaurants within walking distance. There is a supermarket just across the road from the hotel. A few metro stations within walking distance. We did not have the breakfast at the hotel, so can't comment on that. Okay, I've stayed in a few BW hotels, and I wasn't expecting much from this one. I was surprised pleasantly. Okay hotel doesn't look much from the outside. Stepped inside, different story. Check in very quick, good that staff are multi-lingual, as my French isn't all that good. Room allocated was 102. Nice enough room decor good, with exception of carpet, it did look tired, and there was some pretty bad dis-colouring in places. (But I'm not here for the carpet) :) Room had good air-con, safe and a good shower. Breakfast was good, lots of fresh bread and pastries. A few cooked items, fruits, cheeses, cold meats and eggs etc. Getting back into the reception after midnight is easy, just ring the bell. Late checkout is also a bonus. Location wise it wasn't too bad. Bel-Air and Picpus stations are closest, but Nation is about a 15 min walk. Okay to walk to in the day, but I was certainly more aware of my surroundings after midnight walking from Nation to the hotel. Other than that, a pleasant hotel, and one that I would visit again. The room itself is nice and well looked after, but there were a couple let downs. One was the Internet, the speed itself was okay, but connecting to it and trying to stay connected to it was a very big problem. The other was the location, not overly bad as its close to the metro, but there isn't a whole lot of nice places around the hotel. This hotel borderline deserves 4 stars but I gave it 3 because of the Internet. Good location with Bel Air/Picpus/Port De Vincenes Metros 5 min walk away, and Nation 10 min walk. Quiet area, Supermarket Next Door, Good Breakfast, Friendly Staff,Very Good Bathroom. Some very nice restaurants nearby. 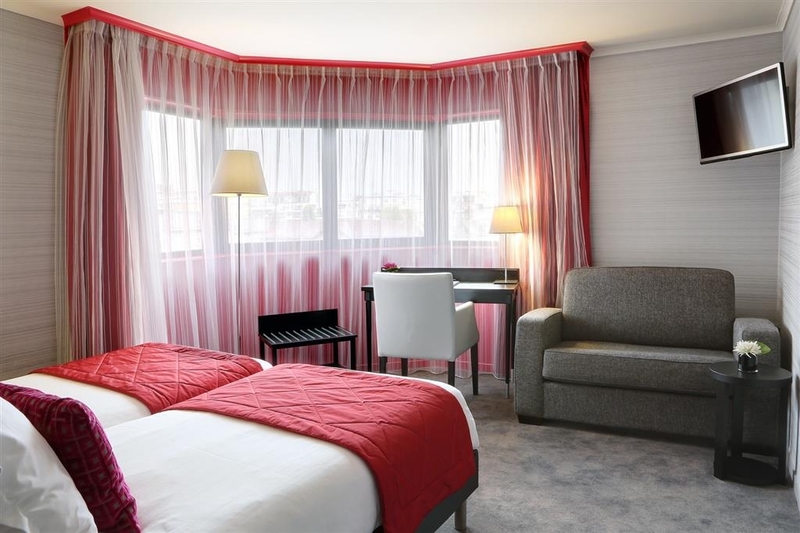 The hotel is ok and good value for the money considering the prices in Paris. I stayed there for 5 nights. The bed is comfortable enough. However, the room is very small, I did not have much room for the clothes ( this may not be any issue for men!). The location is fine but not great. You need between 5 to 10 minutes to reach the metro ( Picpus or Nation). Unfortunately, the service did not meet my expectations, I think it is not acceptable for me to carry my own luggage to the room ( upon checking in and out), especially when I had 2 big suitcases. In other words the service does not make up for the other flaws. Next time I will pay more but stay in a truly 4 stars. 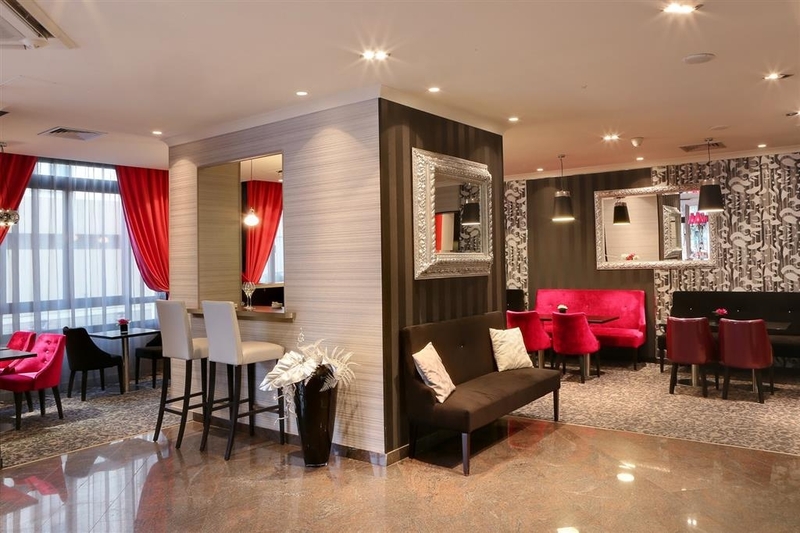 Building renovated, rooms with modern furnituri, LCD TV, a generos bathroom. But, bed towels, little cleaning, breakfast simple. Not four stars. Maximum three. It is located near the subway station Picpus. Great service from front desk couldn't have been more helpful.Room was spacious and the bathroom was modern, all spotlessly clean.The king size bed was a surprise bonus.Good location close to metro station and nice restaurants close by.Highly recommend Chinese restaurant just a few minutes down the road Saveur du Printemps for lunch or dinner..lovely staff and good food.Parking in underground car park suitable only for smallish cars as the lift is not very long.Would recommend this hotel it is quiet and comfortable and within easy access of centre of Paris. "Lovely hotel & staff "
Myself and my boyfriend stayed in this hotel for 6 nights at the end of March. The hotel is very clean & the staff are very friendly. We were always greeted with a warm welcome when coming back into the hotel ( staff can all speak English too, always a bonus!!) 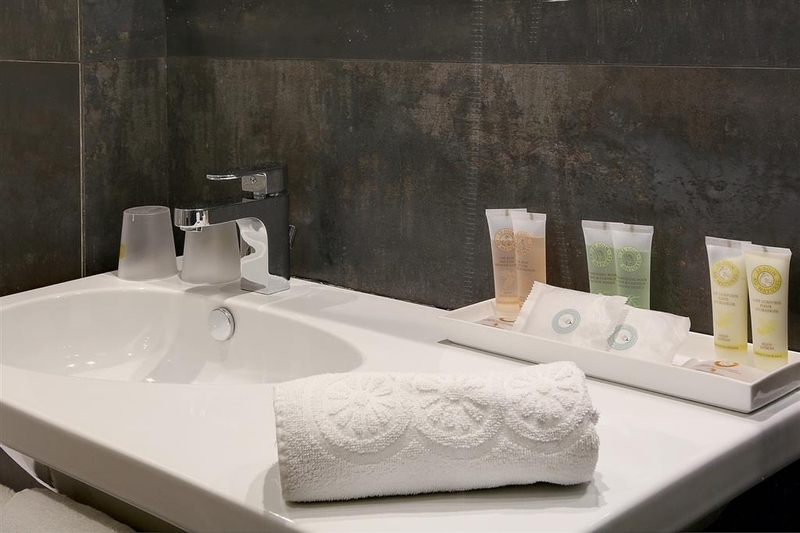 The bathroom was cleaned daily and we were provided with new towels daily. The hotel is not central but there is a Metro station no more than 0.5km away that takes you into the city centre in just minutes. The hotel is situated across from a school and a hospital but there is no noise pollution. Across from the hotel there is a mini supermarket. Overall the area was quiet & I felt safe. Would definitely recommend staying!! Nice room, big and clean bathroom. Breakfast was plenty and very tasty. Nice location, super markets right next to hotel. Easy to access, very good price for value. Personnel was very helpful. Bastille was very close which was full of restaurants and bars. Amazing service from the front of desk team, they were very helpful and answered all of our many questions with smiles on their faces. We could not fault this hotel! 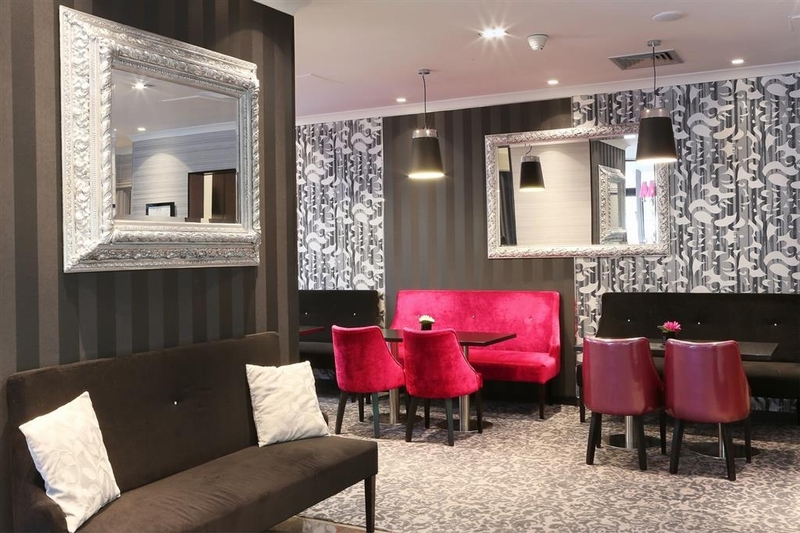 it had just been refurbished and the room was very modern and spotless, lovely decoration in the room and the rest of the hotel. I recommend the breakfast, it was just 13 euros extra and there was a huge selection to choose from. 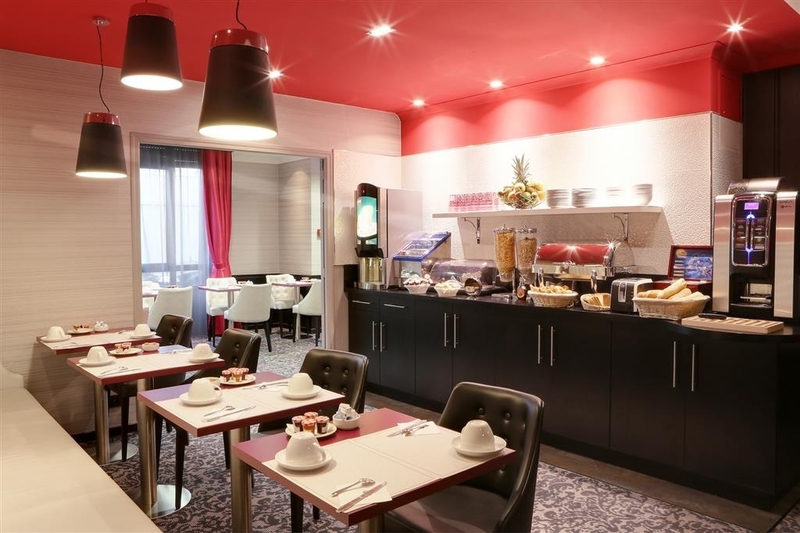 The location of the hotel is great, we found the closest metro to be Picpus, but can be walked too from Nation also, which has alot of quick routes into the city centre and the main attractions of Paris. We felt very safe in this area, there was a college/school opposite the hotel, so the hotel was in a family orientated area which was nice to feel safe, especially at night time. 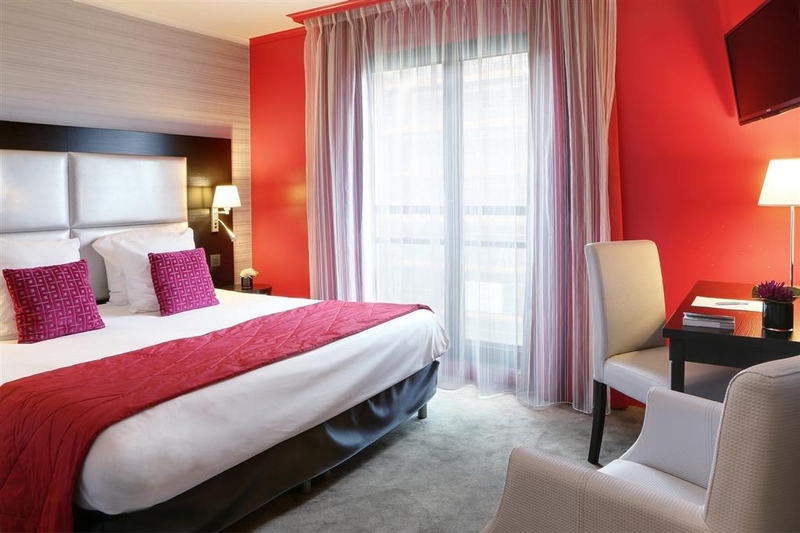 I've spent 4 nights at Best Western Allegro, in Paris, in a little but comfortable room. The toilet/bathroom has always been cleaned well and this is the first thing I check in a hotel. We got to remove the blue cloth and pillows they had put on the bed because we are both allergic to dust. Breakfast was satisfying, there were lot of good things. The day we left, they keep our luggages in a room until late afternoon. 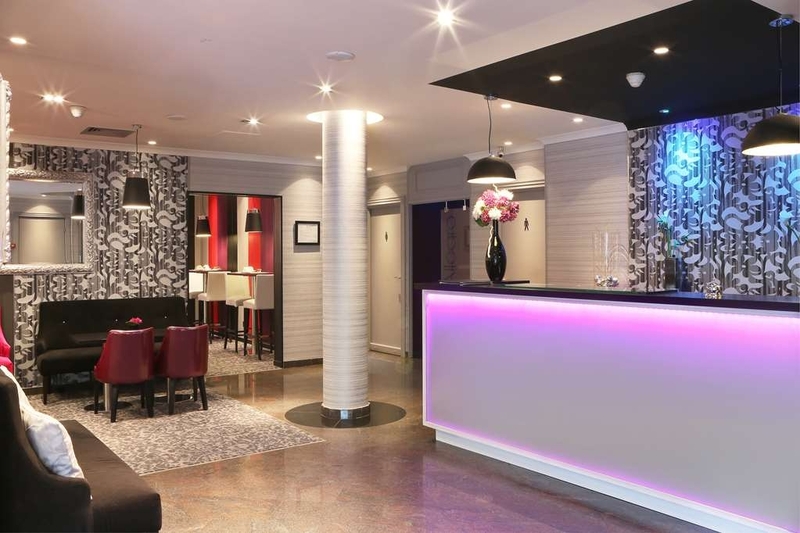 Booked in the morning of my travel and got a great deal £62 for 1 night which I think is great! Don't get checked into room 122 on the first floor as it is immediately above the boiler room, so was difficult to get to sleep. We did mention thus to the staff the next morning who moved us to 121 on the opposite side of the corridor which was peaceful. The rooms are spacious and clean. There is a restaurant in the hotel but we chose to drive to the nearest town where we have eaten before. Lovely area and only a 15 minute drive to Eurodisney. Would definitely stay here again. "Depends on your purpose "
I never do chain hotels in Paris, but I was traveling with a picky American who had never been there. The room was up to the standards of Best Western: modern, clean, practical. The staff was courteous and accommodating. I found the surrounding neighborhood very tranquil, but too far from the center to give me the Paris feeling. 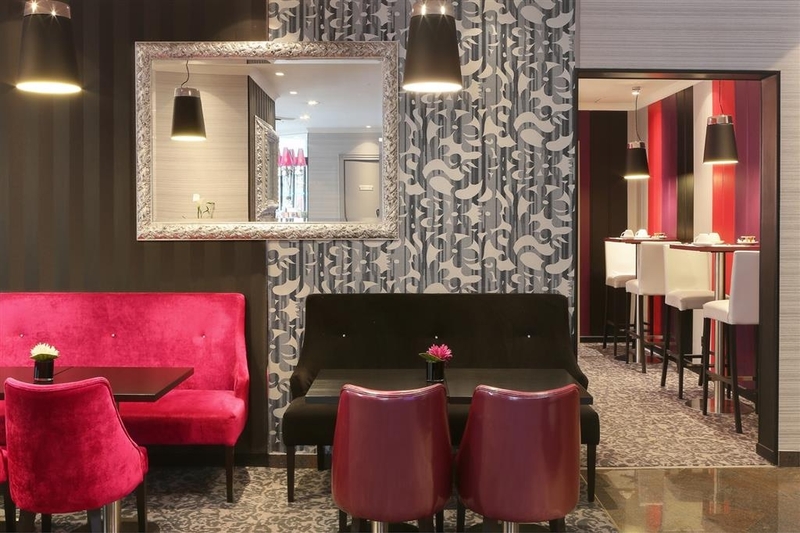 For business travelers is perfect, but I certainly prefer the more centric arrondissements. "Reasonable return for your money"
We stayed 3 nights over the weekend and really enjoyed. The hotel is small (like most hotels in Paris) and cozy. We had 2 adjacent rooms and these were fine, although small. 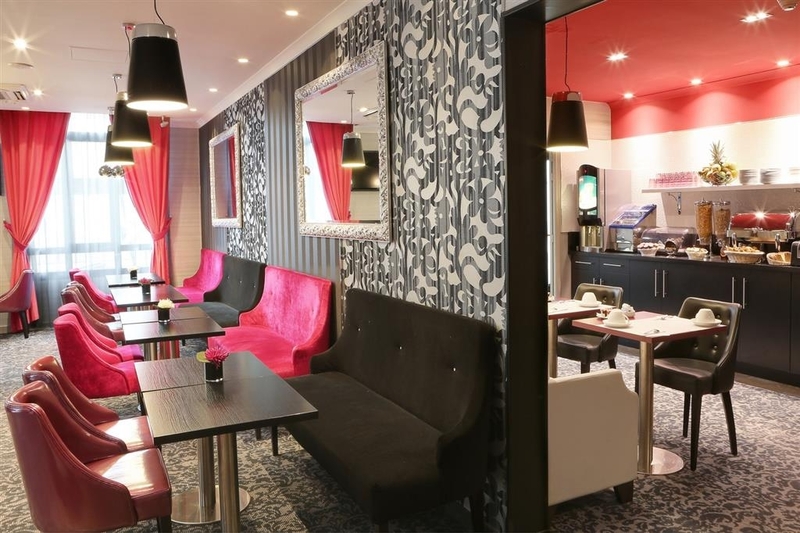 The hotel is situated not far from 2 Metro stations so you can get anywhere in Paris easily. Breakfast was very good ! Overall, good value ! Room was clean, but only 1 shower gel for 2 persons every day is not enough. Staff very friendly. Breakfast ok IVery good location, very fast to the tube and great access to the city centre and attractions. I will come back to this hotel next time. Stayed here is December 2014 for my 30th birthday. It's a lovely little place, staff are great and helpful. It is in a nice part of town felt safe there and would come back to stay here again. It has a metro very close to it as most places do in Paris so getting around was no issue. Really loved Paris. Would recommend staying here great value. This hotel is a small very friendly, the staff was helpful and polite. There isn't much around it to be honest but it's a short walk from a metro station. The room has a good size and the decor was amazing. It had a very nice atmosphere and vibe. the bathroom was small but very nice with everything we needed, the bath tub was amazing if you wanna take a bubble bath! We went to check the breakfast and it didm't seduce us at all that we didm't have breakfast there for the 5 nights we spent there. It was very small and the food didn't look appetising at all for our taste! Only thing to criticize is the different information we recieved at the reception concerning the city taxes. When we arrived we weer assured we would not have to pay these taxes as they would only be collected from 2016, on the day of our check-out we suddenly had to pay them. The rest was simply trés bien! 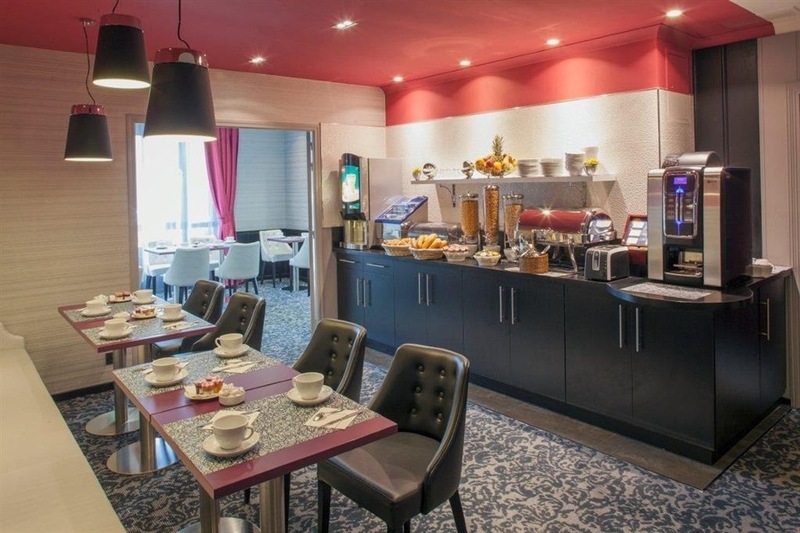 I stayed in this hotel for work, they charge 140 per not without breakfast and the breakfast comes on top 13 euro which is not worth that much at the end. The room is not bad but my shower tube is blocked and I asked them to fix it but it was not fixed at the end of the day. The breakfast is from 7 which for someone who comes for business is late, I went at 6:50 and the breakfast room was almost ready but the guy refused to give me milk and told me it is at 7. The receiption knows a bit of english, and when I asked him to call a taxi for 7:20 he did not call earlier, and at the end I was around 10 min late because the taxi arrived 10 min late by the time he called. 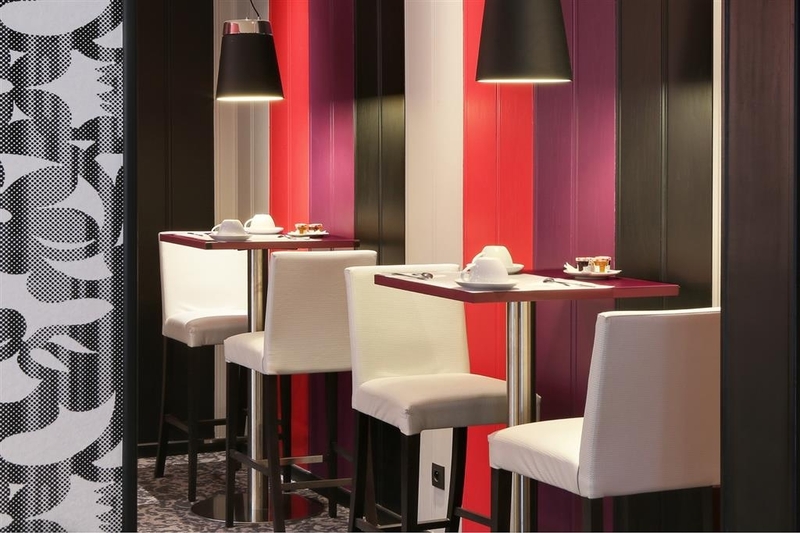 In general I am not happy about the service, I would expect best western as a chain hotel should be able to give more intenational , more flexible and higher service. But next time I will reconsider it for sure. 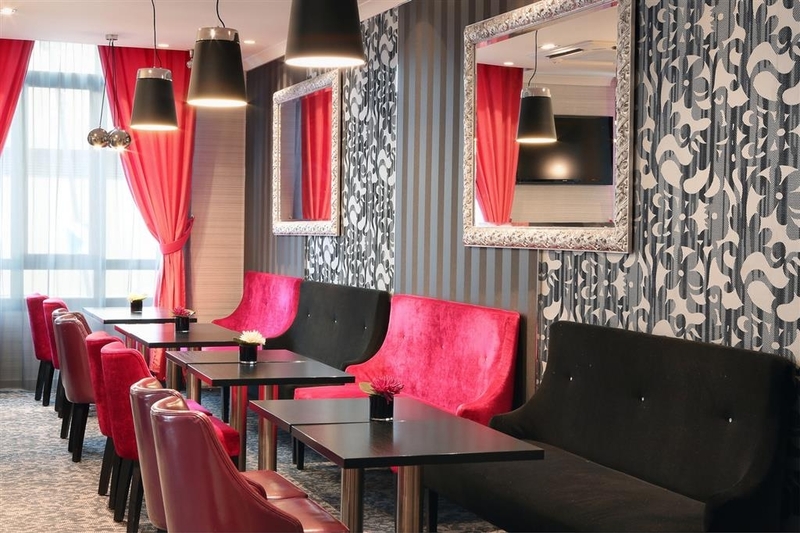 Hotel is lovely, it's easy to find and a short walk from the metro station. The metro is really easy to use, easier then London tube, and I work for London Underground so don't let it out you off of you think it's too far. I loved the location because of the ease of the metro, it's in a quiet area but is so close and quick to get to everything, I think it took us 15mins to get to Notre Dame. The hotel it's self does not look Amazing from the outside but as soon as the reception doors open you step into a current and fashionable boutique. The reception staff were lovely and very helpful, I was worried not being able to speak any form of French other ten the usual bonjour. The room is smallish, but big enough for everything you need, so I would say is a good size although I hope you spend most of your time out and not in the room! The decor was lovely and the bathroom was modern. Shower was very good which is usually a let down in a lot of locations. Bed was comfy apart from the pillows, for me, but absolutely nothing wrong with them physically or technically. The breakfast was included in my booking and was edible with a fair selection. 100% of i returned to Paris I would highly consider book on again ?? "Not the best and far from the worst!" Hotel was well run well and in a nice location for me. Could do with some minor touch ups on decoration, paint peeling and dampness getting into bathroom door due to shower set up! Hot breakfast was a joke (if I'm being totally honest) if you like scrambled or boiled egg only you'll be fine! Not the friendliest of places I have stayed in, staff seem rather uptight and under pressure. Manageress was shouting and having an argument with a past guest (I suppose) that hadn't paid their bill. I understand her frustration but hold your conversation in your office and CLOSE YOUR DOOR! The manager was overheard arguing in a very impolite way with a woman in the recepcion, she was extremely unprofessional! Some of the hotel clerks were not friendly (borderline rude). The room was very small and the hotel is far from the main atractions. It was a very bad choice. I do not understantd how this hotel can be coted as 4 stars. "I would expect more from 4 star hotel"
I would expect more from 4 star hotel. Located in the very quite area. Very small and poorly equipped bathroom. The breakfast is good though you get exactly the same every morning. The main disadvantage is a distance from the city center. 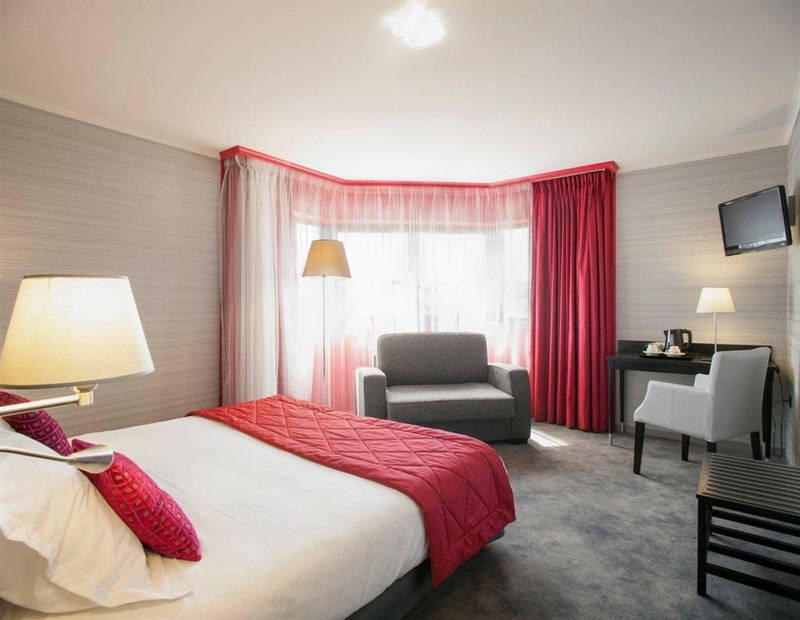 "good budget 4 star in paris"
we stayed at this hotel at family site wich is fact two rooms wiyh a connecting door. room is nicely decorated ad hotel is 5 minute walk from metro station (bel air). there is a grocery store just outside the hotel and few resturants near by. also a small bakery with fresh bageute. as it was booked in last minute the room was priced to grab. The narrow entrance is welcoming. It does not show the quality of the rest of this well-appointed hotel. Rooms are small but still have space for moving around. The bathroom was large in comparison, well worthwhile. the breakfast is correct. the hotel was so beautiful that I almost swooned. accommodation is excellent. 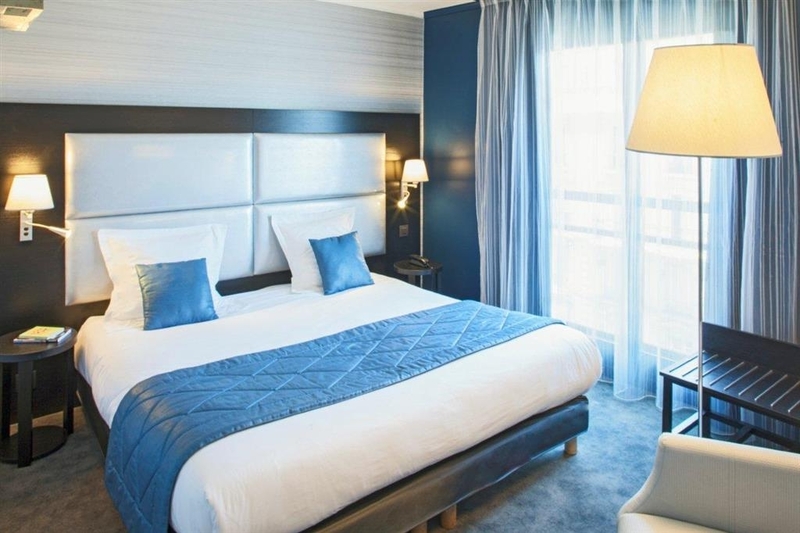 its was a nice stay but it was too far from city centre you have to take a metro to reach there .Rooms were to small and congested.location of the hotel was not good .food quality was ok but they should improve the variety of food.NOT A 4 STAR hotel . Went here last week for 5 days we were expecting a four star and it definitely wasn't it's more a bad 3 star. It's in desperate need of some tlc in places, very worn out especially the paint work in bedroom round windows. The curtains had holes in and the netting on the windows was disgusting. It's also not as close to the centre as what was described to us yes you get the metro everywhere but it was a bit too far out. Wouldn't go back there's much better hotels for this money. 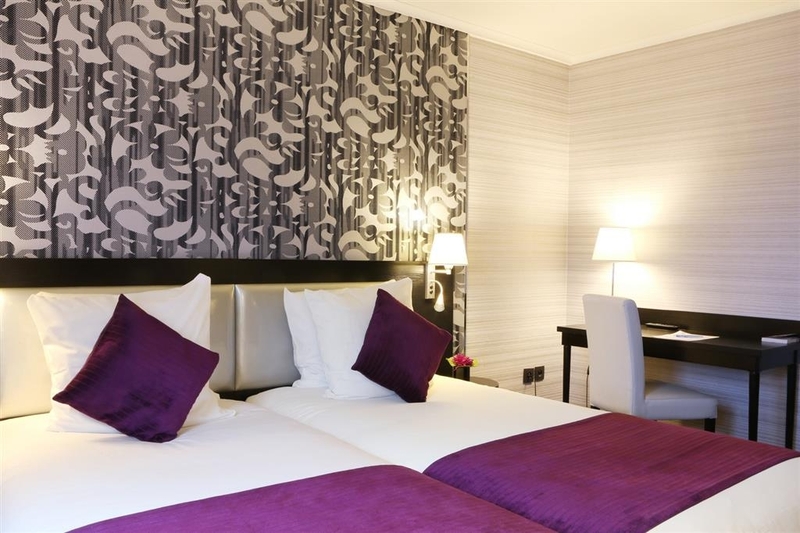 This is a good value alternative to the more expensive central hotels in Paris in a quiet non touristy part of town. It may be a little way out, but the Number 6 metro at Picpus is only a few minutes on foot with the large interchange at Nation (also walkable) to all parts of the city the next stop. So getting into the centre is quick and easy. The hotel has a lift to all floors, the rooms are adequate with a large bathroom, the breakfast is good and the reception staff friendly and helpful - but the internet is slow. There's a supermarket next to the hotel and there are a couple of decent bars near the metro; the nearby Le Picotin restaurant is recommended. We stayed here for a weekend at the end of May, the rooms are not very big and we didn't exactly have a lovely view. We were given a room at the back of the hotel meaning that all we saw was the back of buildings!! There was also what looked and sounded like a dance studio at the back of the building which meant there was loud music and lots of thumping going on during the day/evening. The breakfast is a little disappointing also, I know your in France but they didn't really cater for English people. There was hardly any hot food. However the bed was very comfortable and the staff spoke very good English and couldn't be more helpful. Overall an ok place but wouldn't rush back. 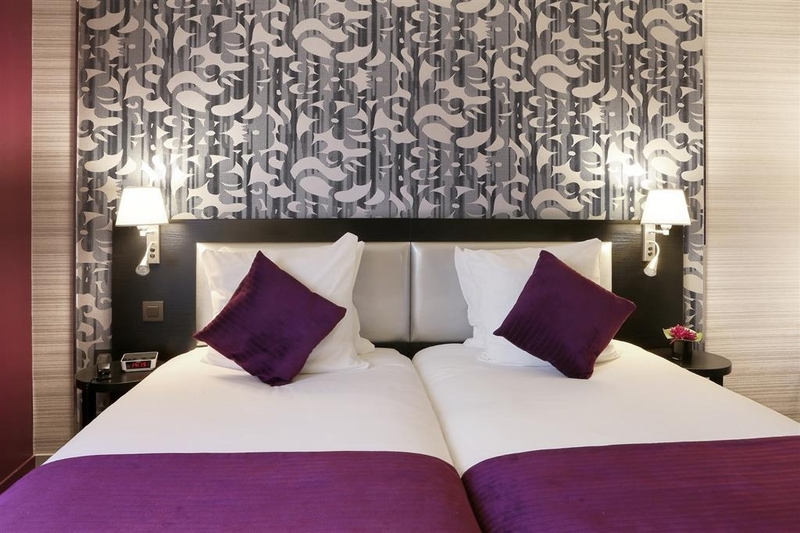 "Good hotel however not a 4 star"
hotel staff were extremely helpful! Spoke very good English and were able to show us maps and pointed us where to go to head towards Disneyland and other attractions. When we got up to the room it was very cold with the air con being on but once turned off the room was a nice temperature. Room was moderately spacious, we had a twin room for a couple. A double room would have been nice but it was ok. The beds and pillows were very comfortable! Great nights sleep and not much noise from outside despite a hospital being across the road (room 403, fourth floor). Our door was particularly creaky, apologies to anyone on floor four! 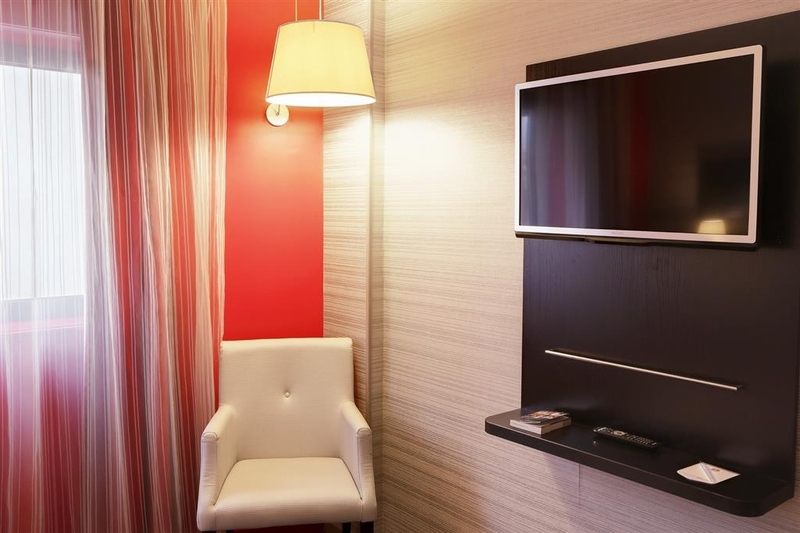 The room comes equipped with a desk, lamps, bedside tables, alarm clock, chair and stool like bench. A fridge would have made a huge difference to he room as milk and tea bags were left for us however without a fridge this seemed pointless. Who wants warm milk? There is a TV in the room which is a good size but if you are not a French speaker it will be of no use to you unfortunately. The bathroom was small, large mirror however. The waterfall shower was nice. There was also a bath so the choice was great to have! To get into the bath proved to be quite difficult, it was a very big step off the ground! So getting out of the shower with wet feet was dangerous, very slippy so please take care!! Our plug hole kept getting stuck when brushing our teeth with the water flowing so we had to put out hand into water full of spot and toothpaste, gross. Then we we got the plug out from the sink hole it was covered in hair, hair that was not mine so that was even grosser. As for the wardrobe it came with a safe and rail to hang clothes. There was a sticky spill on the floor of the wardrobe when we arrived. In general the room was cleaned well however the alarm clock was really dusty. Behind the curtains the paint was peeling off of the wall. Above the shower the paint was peeling off of the ceiling, likely due to steam however this should be fixed. The lounge and reception were greatly decorated and everything looked very modern and nice. The bar was small but we never made use of it. Breakfast is served from 7:30-10:30 but it's probably best to get down early so all food is not gone. Pancakes and breads are served and also scrambled egg and bacon however the hot food looked as though they had been sitting out for a while so we didn't eat it. There is also yoghurt and fruit. There's a tea and coffee machine which we didn't make use of. If you're going to be walking around all day eat lots at breakfast as restaurants etc outside of the area are more expensive due to being near attractions and such. The hotel is in a good location for metros and trains. May have been better if it was closer to the centre of Paris but then I suppose you'd end up having to pay more for your stay. Nation (big station with many lines, go here for Disneyland etc) is a 10 minute walk and picpus is 5 mins away. We would usually go from nation to picpus at night to save walking back (lazy tired tourists!) Once you can work out how to use the train system you will be great. Overall the hotel is ok but I wouldn't say it is a 4 star, maybe 3 star. We just spent a week at the Best Western Allegro Nation, and I have no complaints at all. The location is perhaps not the most convenient to the Louvre and such, but the location allows a MUCH lower price, and a nice quiet neighborhood. The staff was nice, the breakfast was great, the room was clean and comfortable (but snug), and there was very little noise (our room overlooked an interior courtyard sort of space). There are two metro stops for the #6 line very close, but we usually just did the 12 minute walk to the "Nation" station that has 5 different lines, including the #1 that goes to the most popular sights. We got the best rate on this hotel through Trip Advisor, by the way. Room supposedly had wifi, but it seldom worked well with my phone.